To write about life behind the steering wheel, sometimes you must spend time in front of the steering wheel. That’s why I found myself underneath and on top of both the QE I, my ’66 Series II-A 88” SW, and Gilroy, my ’97 Discovery I SE-7. For reasons not yet clear, the QE I decided that it would only go into second gear. It made for a slow ride across the island, but it chugged its way home. The clutch mechanism and hydraulics operated as they should, so I tested out the linkage next. Sadly, they seemed fine, also — that left the problem inside the transmission. About 15 years ago, I suffered through a rebuild of the transmission that came with the II-A when I bought it in 1991. Removing the seat box and floorboards, likely in place since manufacture, took many cans of PB Blaster and a lot of wrenching. I became a walking carcinogen when the local garage owner gave me a key to his shop and I spent every night washing the innards of the transmission in kerosene. With his help, I learned how to interpret an exploded diagram from the Haynes Manual. 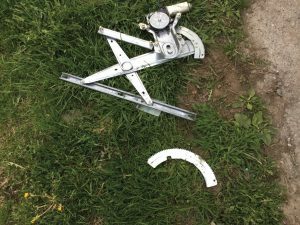 With some mangled gear teeth, broken synchromesh rings and worn bronze thrust washers, the rebuild required replacements from Rovers North. I also had a list of “while you’re at it” parts, such as bearings. 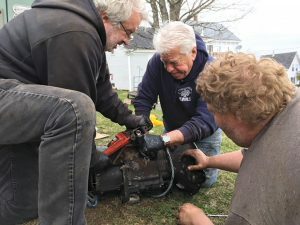 With the help of the local mechanic and his engine jack, the transmission case came in and out of the car with relative ease. I prayed never to have to tackle that job again, but my prayers went unanswered. I contemplated another rebuild, but ran into several complications, including weather (snowstorms in March), workspace (outdoor only), mechanical assist (no hoist, no nearby tree strong enough), and lassitude. When Rovers North came up trumps with a rebuilt II-A transmission, I jumped at the chance to bypass the rebuild. It looked gleaming on its pallet; now, I just had to figure out how to install it. In the meantime, I unbolted the floors, transmission tunnel pieces, gearshift lever and seatbox, and removed them from the car. I do not resemble Hellboy, and therefore would need to con friends into helping me remove one transmission and install the other. A slow start to the lobster fishery this Spring provided me with one helper and a Tom Sawyer moment [“Hey, what are you guys doing? That looks interesting! Would you let me help?”] provided a second assistant. 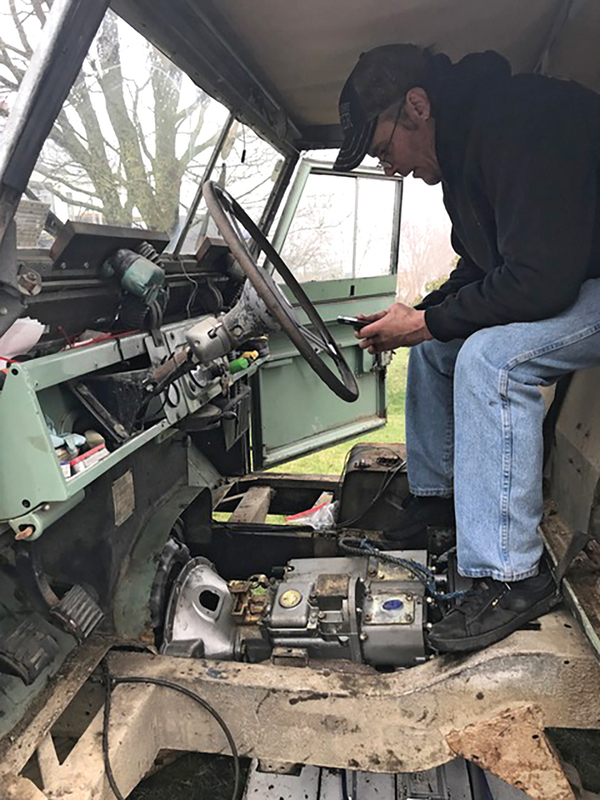 We removed the bellhousing bolts and the speedometer cable, slid the transmission and transfer case back, and with ropes, lifted it out of the II-A. Now came the challenge of installing the replacement — and doing so correctly. My good fortune arrived in the presence of two enthusiasts: Lou Sapienza and Steve Allender. Camel Trophy photojournalist and Land Rover aficionado Lou took a break from the creation, in the midst of a custom Series III into which he had recently installed a transmission in his mainland shop. Lou’s knowledge and expertise came in handy; he, his wife Jana, dachshund Sarge and large trolley jack would happily come visit the island. Steve Allender recently left his decades-long tenure as a service tech at Maine’s sole Land Rover dealer to become a service manager at another shop. 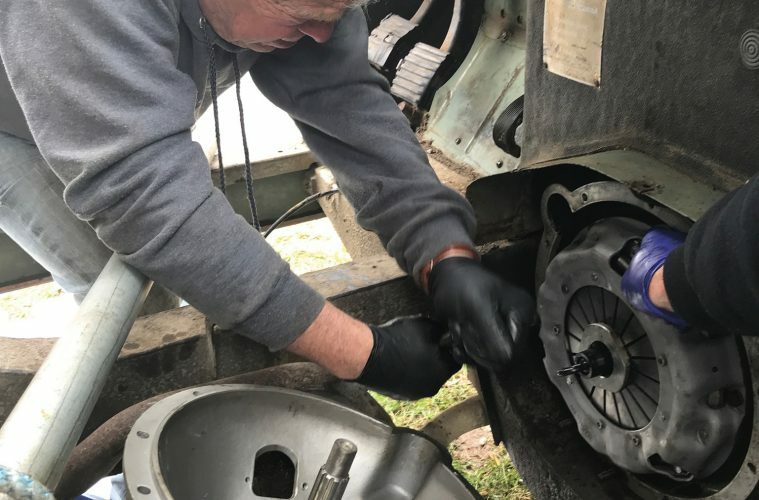 While I traveled to Land Rover events in New York, Florida and Texas, Steve had undertaken preventative maintenance on Gilroy: head gaskets, oil cooler lines, spark plugs and wires, O2 and ABS sensors. The fact that he —rather than me — discovered and solved the dreaded previous owner bodge of a heli-coiled spark plug thread relieved me to no end. When that job took longer than anticipated, he loaned me “BRAAP,” his ’96 D1 with its long list of unique driving requirements. I added a new item to his list — a duff starter. Since he wanted his D1 back, he would drive Gilroy to the island, bring and install a parts-bin starter and help me with the transmission swap — all in the same day. Thus armed with their shared expertise, we tackled the transmission work. With the clutch exposed, it made little sense not to change it out. Accompanied by much grunting, some cursing, and several beers, the new transmission slid into place. We hooked up the clutch mechanical and hydraulics, then started up the engine. That’s when I discovered I could not shift gears without grinding with the engine running. The clutch pedal had the right heft and feel, but not the corresponding action. When confronted with knotty problems like this (well, challenging for me), I plead to Rovers North for help. This time, Arthur Patsouris got stuck with me call. 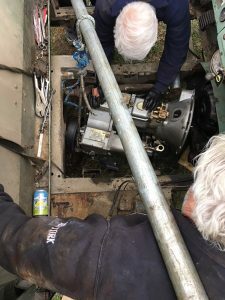 His considerable knowledge and experience helped him create a checklist of potential issues, and we wound up focused on the slave cylinder rod. A Genuine Parts one has threads on one end, so it will screw into a clevis at the clutch rod; mine, which came with my II-A 27 years ago, has threads at both ends. The rod’s action transmits the force from the clutch pedal to the fingers of the clutch pressure plate; if it’s not enough, the clutch plate will not release sufficiently. Arthur focused my attention on the rod, which made me realize that the threaded portions of this rod were unequal; when I screwed in the longer end to the clevis, the clutch released properly. Now I could finally start reassembling the floor boards and transmission tunnel and return the QE I to its workhorse role. While I’ve always enjoyed the sliding windows of the II-A, my D1’s electric windows have spoiled me [see Spring 2018 issue]. Pushing the window button on the console one day resulted in a scary thud as the window glass dropped into the door — blissfully, without the accompanying sounds of shattering glass. With rain predicted, I drove home and once again removed the door card. 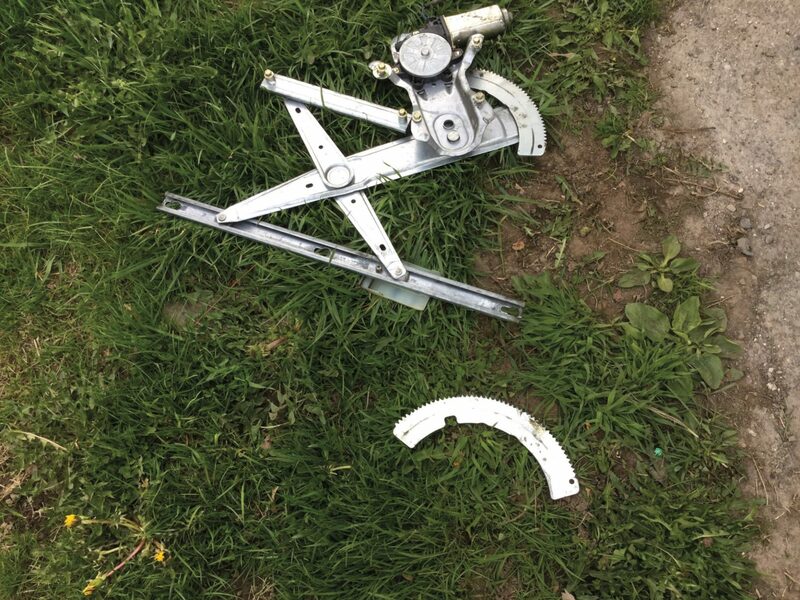 This time, the window regulator’s gear had sheered off the scissors mechanism. Happily, I had a replacement regulator and door card buttons from Rovers North on hand and the replacement repair went smoothly. I do receive a good deal of guff from islanders about the amount of maintenance undertaken on my vehicles. It’s helpful to me to remind them [and myself] that the QE I and Gilroy are 52 and 21-years-old, respectively, highly entertaining to drive and enormously capable of multiple tasks. 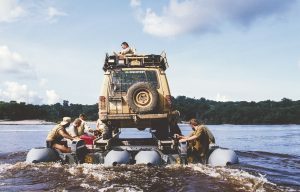 Or as Richard Hammond suggested on Top Gear, your Land Rover should be busy doing something significant.